If you’re something of a tech fanatic, the chances are you’ve been keeping a close eye on the wireless headphone market for the last, what, ten or so years? It’s been, I’m sure you’ll agree, painfully—often irritatingly—slow progress. But things are finally looking up. 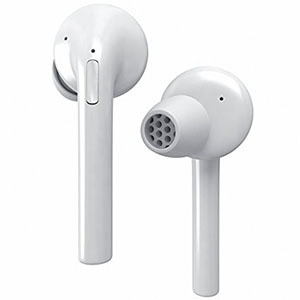 With the recent release of Apple’s AirPods (which, like them or loathe them, signal a major swing in the market towards wireless tech), it’s never been a better time to shop for wireless headphones with companies the world over responding to this newfound gap in the market. But you know that already. You’ve done the research, you were ahead of the curve, and that’s why we love you. Sound quality is pretty faultless for a wireless device. That carry case. We’re in love. No noise cancellation, but this isn’t a deal breaker. 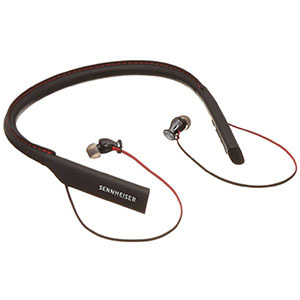 Sennheiser’s earbuds are every bit as impressive as their headphones. We get to appreciate all the same qualities, including but not limited to sound, style, build quality and aesthetics. All of these are really accentuated with their HD1 series earbuds. You are looking at a rigid necklace design with integrated controls, a set of really impressive earbuds and a quality cable running between them. When it comes to performance, we pretty much got exactly what we’ve expected. Sennheiser HD1 offer an impressive battery life that reaches 10 hours per charge where charging takes only about an hour and a half. In terms of sound quality, HD1 have honored their heritage with a very well saturated but ultimately balanced performance. Add to that the functionality, and you have a winner. In a typical Bose fashion, QuietControl 30 Wireless Headphones introduce something completely different to a market that is pretty much saturated. Not only is the sound quality impressive, but you can also manipulate the amount of noise canceling thanks to Bose’s proprietary tech. In other words, you can choose when to have complete silence and focus on the music, and when to let noise in. In terms of design, build quality and comfort, Bose has met our wildest expectations and then some. We definitely like the rigid necklace design which may appear to be a bit limiting at first. However, when you actually start using it, you realize just how much sense it makes in the long run. Overall, Bose has done it again and made wireless earbuds more exciting. Minimalist and high end can either be the best combination ever or a complete flop. 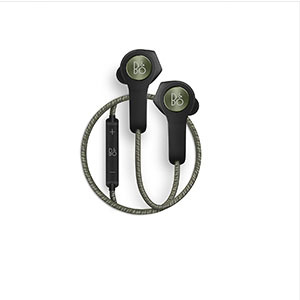 In case of B&O Beoplay H5 Wireless Earphones it is definitely the former. Known for their stylish designs, B&O has decided to reduce the whole wireless earbud design to a level where you’re only left with the most basic pieces. As it turns out, the result is magnificent. What really impressed us the most is the fact that by going for a minimalist take, B&O sacrificed nothing when it comes to comfort nor functionality. As a matter of fact, you could say that Beoplay H5 excel in these areas due to their rather light weight nature. With several available color combination you are bound to find something that works for you. Simple and clean design that tends to work no matter your personal style. Great build quality and lightweight chassis make these quite durable. Good sound with plenty of definition across the range guarantee a positive experience. One of the better battery life stats in this particular segment of the market. While we appreciate simplicity, E18 may be a bit too simple for some users. 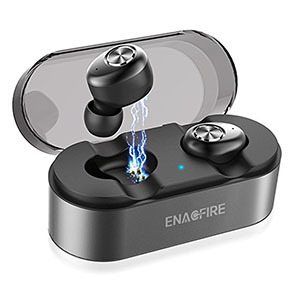 Compared to most other similar solutions, ENACFIRE E18 comes across as a very capable set of earbuds. They went with a fully wireless setup that is packed with good hardware but also pretty stylish. Overall, the build quality and durability are on point. Considering how inexpensive these are compared to most similar models, it seems that ENACFIRE has struck gold with E18. When it comes to performance, the situation is pretty much the same. We see a great sonic balance that is boosted by a pair of pretty long lasting batteries. The entire package is fairly compact making it easy to carry around every day. One of the side effects of such a small footprint is lighter weight. Because of that, these can work in all situations. Very clean and functional design backed up by good build quality. Good selection of hardware makes these consistent as well as reliable. Pretty great sound with plenty of saturation all across the frequency response range. Good battery life allows you to use these all day every day. Additional ear tips that come with these could have been more diverse. Borrowing ideas from highly successful designs has been the name of the game forever. Bitzen is fully aware of that, which is painfully apparent when you check out their Bluetooth Headphones. Aside from having the same aesthetics as some pretty popular earbuds on the market, Bitzen has basically replicated the success of the entire concept. As such, they are definitely worth checking out. Best of all, you can get that at a fraction of the price. This set differs from the EarPods in a number of ways, but none of those differences are enough to completely disregard the performance and comfort Bitzen Bluetooth Headphones have to offer. On the contrary, thanks to their simple but functional format, these are easily among the most practical models out there. Bang for the buck value that is really hard to beat. Good sound without a tangible bias makes music a joy to listen to. Extra ear tips aren't really all that great when it comes to sizes. While they are fairly minimalist, Otium Bluetooth Headphones are also pretty old school. The reason for that is quite understandable. Otium wanted to dedicate most of their resources to both performance and comfort, which is why they have chosen to utilize the already proven over the ear design. In reality, this format is perfect for those who are active but on a budget. In this particular case, minimalist doesn’t mean sub par. On the contrary, Otium Bluetooth Headphones are pretty great when it comes to features. We are looking at simple but extensive controls, great sound across the frequency range, as well as a very durable build quality. On top of all that, Otium Bluetooth Headphones offer some 8 hours of playtime per charge. Stylish exterior makes these one of the best looking earbuds out there. Plenty of power coming from a great set of drivers. Small, compact and lightweight exterior reduces fatigue and increases comfort. One button control makes using this set extremely easy and functional. The only complaint we have has to do with battery life. Expressing yourself through tech can sometimes be quite a challenge. When most brands are rushing towards the all white or gunmetal gray color themes, it is quite refreshing to see something that is completely different. KNGUVTH Bluetooth Headphones V4.2 not only gets you that aesthetics that stands out, but these also follow through when it comes to performance and other things. What we’ve noticed is just how light they are and how easy it is to use them on a daily basis. For such an affordable set, you’d expect to get a package that is full of compromises. That’s not the case here. While aesthetics were obviously a huge part of the whole process, KNGUVTH have covered their bases when it comes to performance and hardware. Great, proven design inspires plenty of confidence when it comes to heavy duty use. A good set of drivers make these earbuds quite powerful but also balanced. Battery life is more than good enough for constant daily use. Different color themes allow you to express yourself and your style. The only thing missing are better cable guards but that's a minor flaw. Going with a proven setup that has just about no flaws at all is a great way to ensure a good following. SoundPEATS could have chosen to pursue more modern designs, but instead they have stuck with what works great. Because of that, their Magnetic Wireless Earbuds are among the most popular ones you can get right now. That is not all, though. They have done a great job at ensuring that performance, comfort, retention and overall durability is on an acceptable level. As a matter of fact, we are happy to report that it is much better than just acceptable. Considering how affordable these are, you will have a hard time finding a set that is anywhere close to these in terms of bang for the buck. The benefits of wireless earbuds don’t take much imagination to understand. In essence: they’re in-ear headphones, but they don’t have any wires. And who likes wires, right? Cumbersome, clumsy, and a single snag will pull the whole thing out of your ear. Horrid. Seriously, though, wireless earphones are clearly as much of an important part of the future as wireless internet, wireless charging, and wireless anything else. As a society, we’re gradually moving in that general direction for the sheer convenience that it affords. 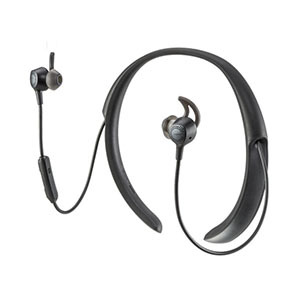 Wireless earphones are also a particular favorite amongst sporty types. 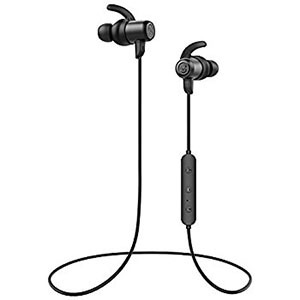 Their lightweight form factor makes them an obvious, convenient choice across a wide variety of activities, and many of the best reviewed in-ear headphones designed for running feature wireless technology in some form. As with anything wireless, there’re always trade-offs which you will have to account for before purchasing. As long as you’re aware of what they are, and as long as your decision is as informed as possible before purchase, you’ll be fine. The main one, of course, is audio quality. Just as wired internet has been, is currently, and will for some time be faster than its wireless counterpart, so too is the upper threshold on audio quality lower in wireless earphones than it is in wired ones. This is, however, a fairly relative, subjective metric. Unless you’re an ardent audiophile, chances are you won’t be able to hear (or, at least, won’t be terribly interested in) the differences between a similarly priced wireless and wired offerings. It exists, but it’s often not a huge deal. Another consideration which many overlook is the fairly obvious matter of battery life. 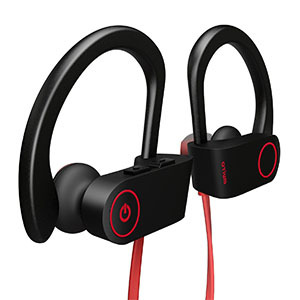 Unless you’re dealing with some kind of active noise cancellation technology, wired headphones do not, for the most part, require any kind of charging, battery changes, or other messing around. Wired units, by contrast, absolutely do. You should be aware that hearing the foreboding ‘low battery’ prompts from your device is going to be part and parcel of owning a pair of wireless earbuds, at least until you get properly used to managing the charging cycle to fit your own requirements. This is very much a personal decision, of course, but the two main concerns which we’ve found are shared amongst most reviewers are battery life and audio quality. Feature sets tend to be fairly minimal, design can vary a great deal (and is even more subjective than sound quality, so we’ll leave it to you), but dead headphones are dead headphones. Interestingly, price does not always correlate positively with the duration you can expect from a single charge. Some of the more expensive earphones models we’ve looked at underperform in terms of battery life but overperform elsewhere. As with most things in life, it’s a game of compromise. As long as you know which priorities are your main ones, and as long as you commit to reading as much as possible before you purchase, you’re going to be absolutely fine. We promise. Are Wireless Earbuds Worth It? In all honesty this question is quite outdated. When wireless earbuds first appeared, people were rightfully skeptical. However, these days we know that the technology works. The real question should be whether or not you wireless earbuds are compatible with your lifestyle. As things usually are with more advanced tech, where there are obvious benefits there are also a few drawbacks. With wireless earbuds, those flaws are mostly related to the battery life. Actually, it isn’t even the battery life but rather the fact that you have to recharge the device. Believe it or not, this is too much of a chore for some users. One thing we like to recommend to our readers when it comes to wireless anything, is to figure out with yourself whether or not charging said devices is going to be an issue. If it isn’t, more power to you. However, if you constantly end up forgetting to charge your earbuds, you will quickly find out that whatever perceived benefits they offer are more or less useless if you can’t use them. In that case, we strongly suggest that you stick to wired earbuds. 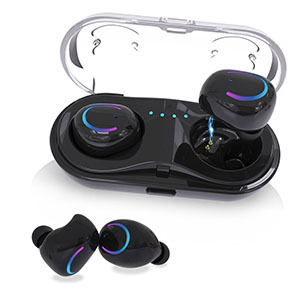 Another thing to keep in mind is that wireless earbuds rely on positive Bluetooth connection in order to work, but also to reach the necessary level of sound quality. Naturally, with better earbuds this ‘issue’ begins to matter less and less. Can Wireless Earbuds Compete In Audio Quality? There is a pretty good reason why you don’t see too many wireless headphones. As a matter of fact, wireless is extremely rare in the higher tier headphones in general. There is a reason for that. The overall consensus is that wireless is not yet at the necessary level of optimization for it to transmit audio signal at a necessary resolution. But wait, you might say, doesn’t that mean that all wireless earbuds are subpar as well? Not necessarily. First of all, Bluetooth technology has advanced to a point where good quality sound isn’t that hard to deliver over such short distances. However that isn’t the main reason why these issues don’t really apply to earbuds. The truth is that earbuds by default are not really comparable to headphones when it comes to resolution and definition. Because of that, you could say that the acceptable margin of error in terms of sound quality is a bit higher with earbuds. Generally speaking you shouldn’t really worry about wireless earbuds and audio quality. Even if you are among the most conservative audiophiles, chances are that you will be pleasantly surprised with how most of the models on our list behave. Besides, enjoying high quality audio outside where noise pollution is a real nuisance is why most audiophiles wait until they are home to do so. In our opinion, you won’t even notice any flaws in the audio quality with most of our picks from this list. On the contrary, some of them are quite impressive when it comes to audio. Don’t let people put you off the idea of buying your own pair of wireless headphones. A lot of audio purists will warn you against them, but the likelihood is that they haven’t bothered to check out many of the massive improvements to sound quality which have come about in just a few short years. Sure, you aren’t going to get the same listening experience as you would with a $1000 pair of over-ear monitors, but most people don’t want or need it in the first place.